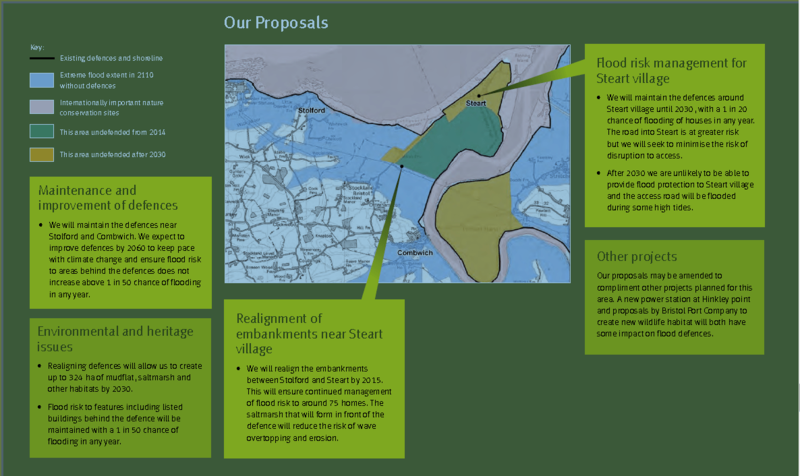 The EA’s 2011 document Managing flood risk on the Severn Estuary provided the EA’s vision for Steart Peninsula including what subsequently became the Steart Marshes salt marsh scheme. 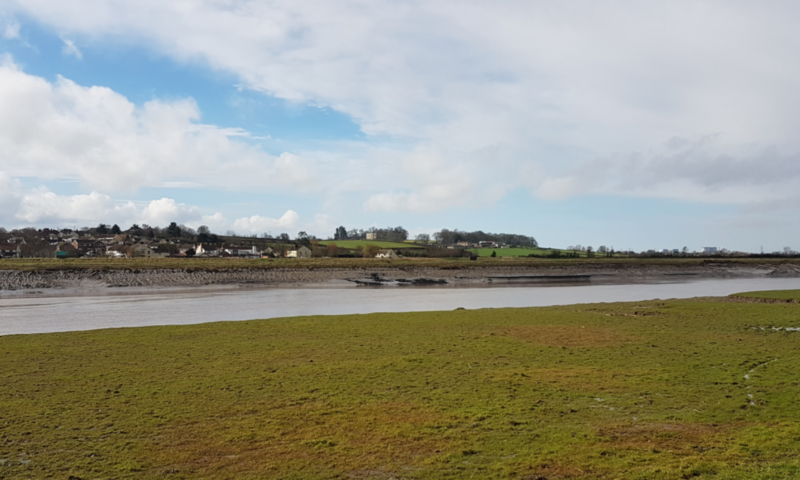 Under present plans six years after the completion of the proposed Bridgwater Tidal Barrier Pawlett Hams will cease to be defended. That means that the river banks will no longer be maintained and the process of handing more farmland back to the sea will start again. The estuary will in time return to the state it was in more than 500 years ago before the levels were drained. According to the EA this will see 387 Ha or just under 1000 acres of farmland lost to food production and the local economy although only 47Ha is actually required to make up for coastline squeeze. 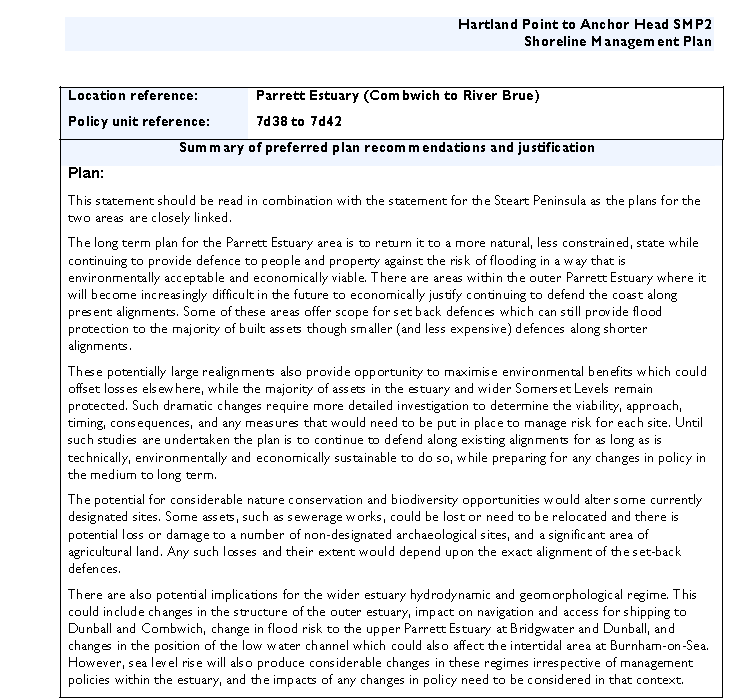 The Parrett Estuary Flood Risk Management Strategy (PEFRMS) is a document remarkable for its narrow vision that is more interested in extending the habitat for birds whilst completely failing to understand or chooses to stay silent on the impact of saltwater on agricultural land. The only economic impact considered seems to be tourism. 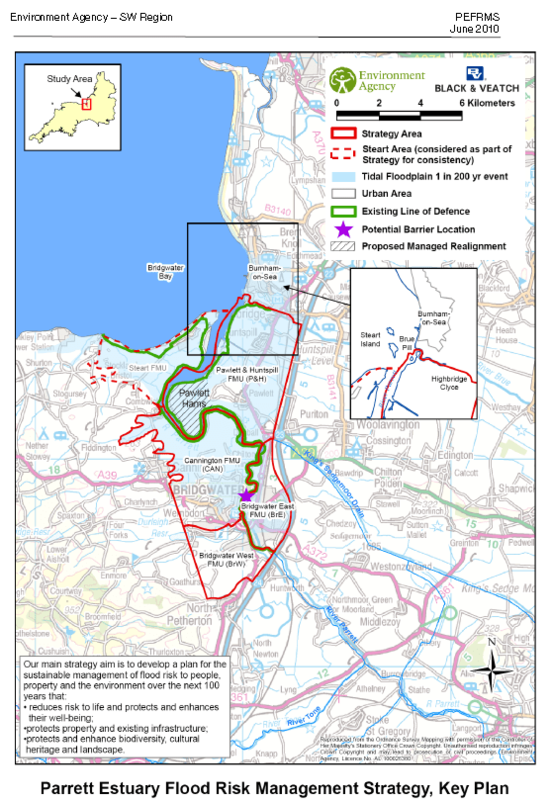 North Devon and Somerset Shoreline Management Plan (Hartland Point to Anchor Head), Halcrow, due 2010. We are concurring with their emerging policies. 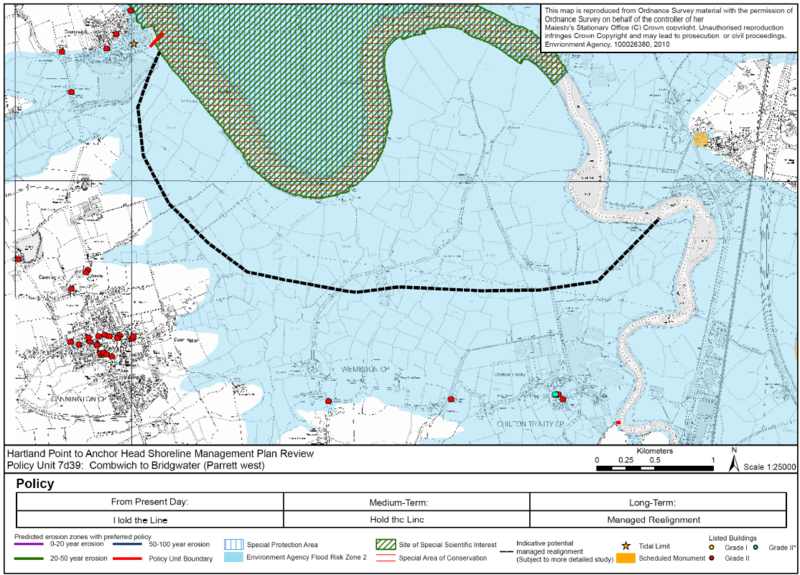 As such much of the real detail is provided in the EA’s Shoreline Management Plan rather than the overarching Parrett Estuary Flood Management Strategy which is a long term plan to let down the flood defences along the River Parrett allowing the sea up to the edge of Chilton Trinity and trading off land in Sedgemoor for economic development elsewhere around the Severn Estuary. It is a step back in time with individual communities afforded long term term flood protection rather than comprehensive flood defence. 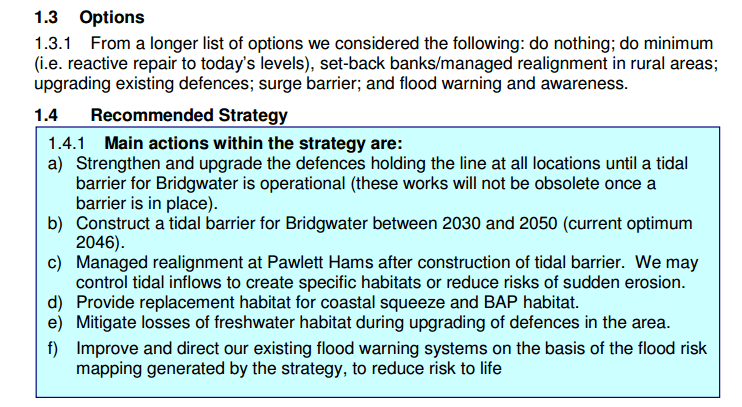 The high level strategy for the PEFRMS is provided below following on is information from the shoreline management plan and recently available information for the preferential flooding of farmland as part of the Bridgwater Tidal Barrier Scheme. 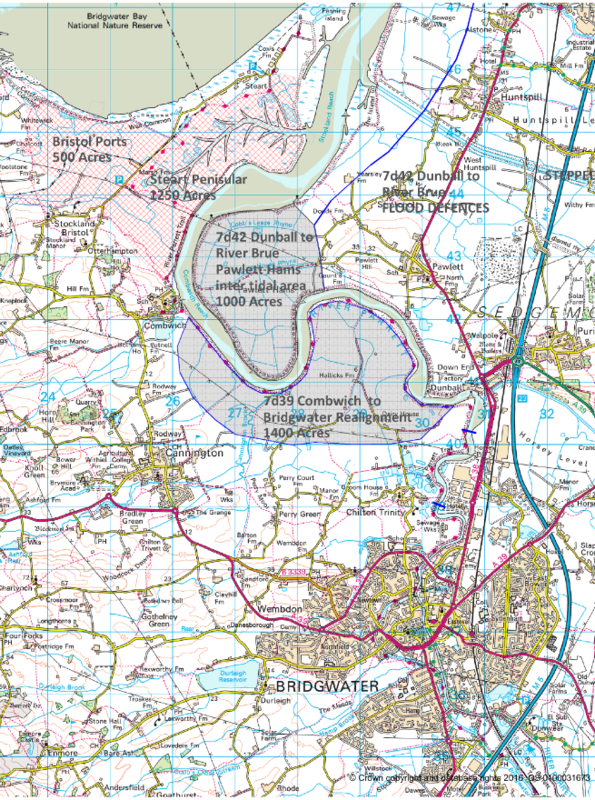 Pawlett Hams Realignment is the complete loss of Pawlett Hams as can be seen from the key plan in the Parrett Estuary Flood Management Strategy and noted in item c above. 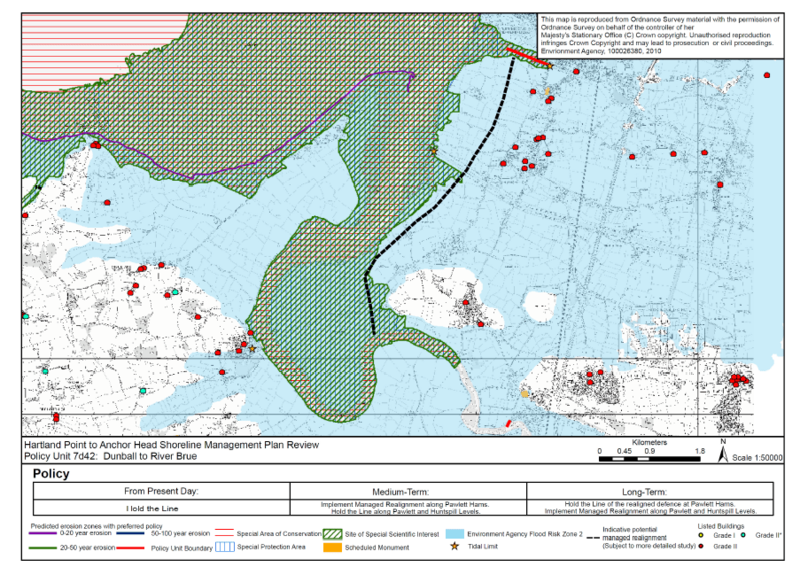 Applicable Shoreline Management Plan delivery of the Strategy that includes the loss of 387 Hectares (1000 Acres of land) at Pawlett Hams is reproduced below. Individual policies for various sections of the River Parrett and adjacent land are listed below. 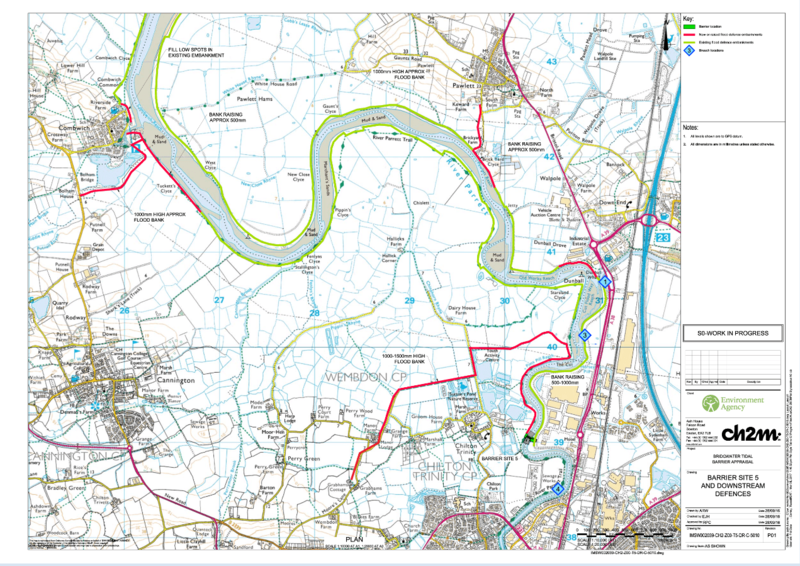 7d39 is worth noting as it has the next major realignment of the flood defences after Pawlett Hams allowing the River Parrett to come up within 1000m of the village of Chilton Trinity. South of the Parrett the EA ultimately proposed to let the marshes return to the very edge of Bridgwater whilst Sedgemoor District Council and the EA’s Bridgwater Barrier team have left a space at site 4 for a bridge that is on the way to a planned inter tidal area and represents the expansion of the Steart Peninsula scheme up to Bridgwater. Policy 7d39 Combwich to Bridgwater (Parrett west) managed realignment. Those two policies when implemented will along with Steart Marshes and the Bristol Ports land transform the Parrett Estuary. There will be no new link possible between West and East Somerset. Total agricultural land lost to agricultural will be around 5000 acres. There is a certain irony that the EA policies will in reducing UK agricultural land export food production abroad and potentially increase famine oversees. 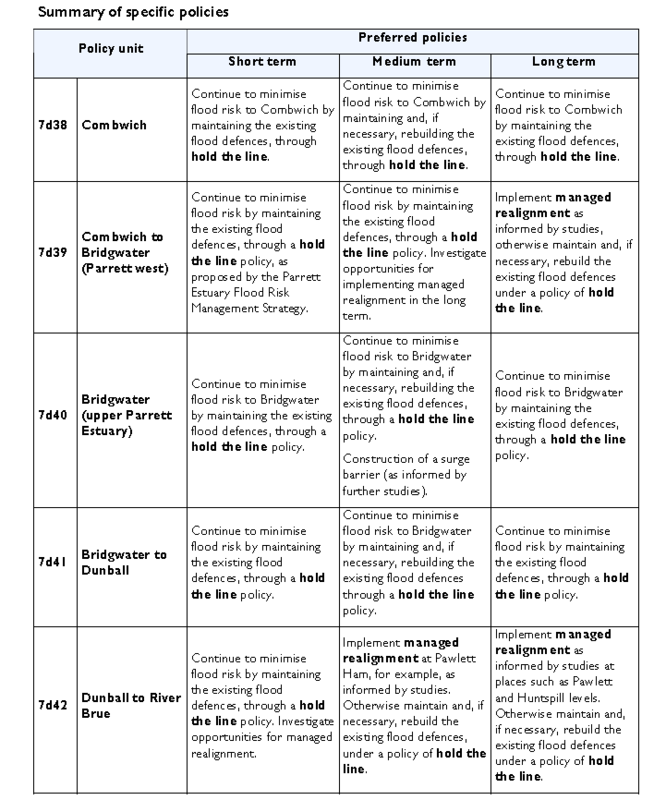 In the short term the proposed secondary flood defences shown below are required because the EA will not keep raising the banks above the present levels. sea level rise will continue and the frequency of seawater flooding will increase. 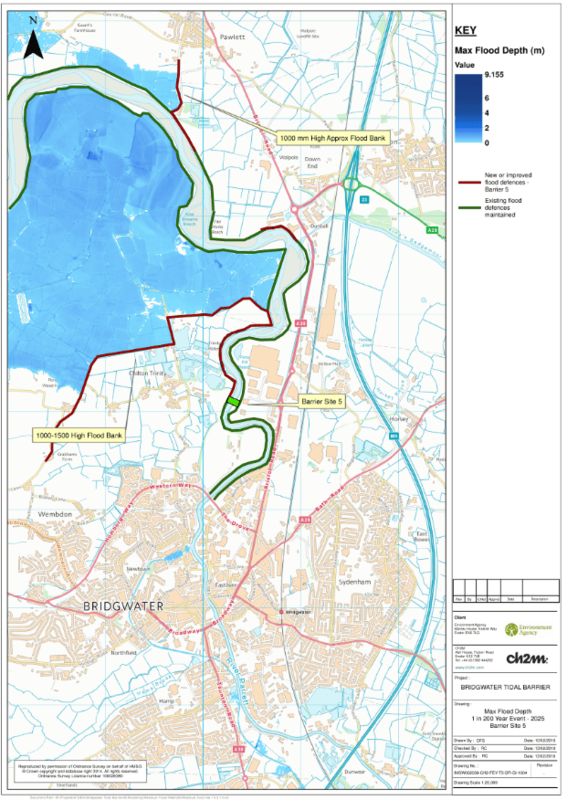 The route of the secondary flood defence is not dissimilar to the future managed realignment above. 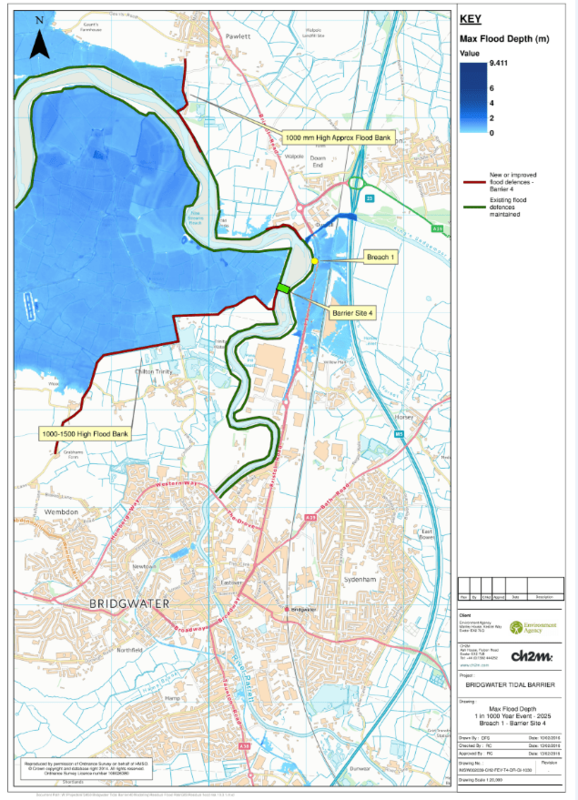 After the planned completion of the Bridgwater Tidal Barrier a 1:200 flood is expected by the designers to flood land to the north of Chilton Trinity with saltwater. 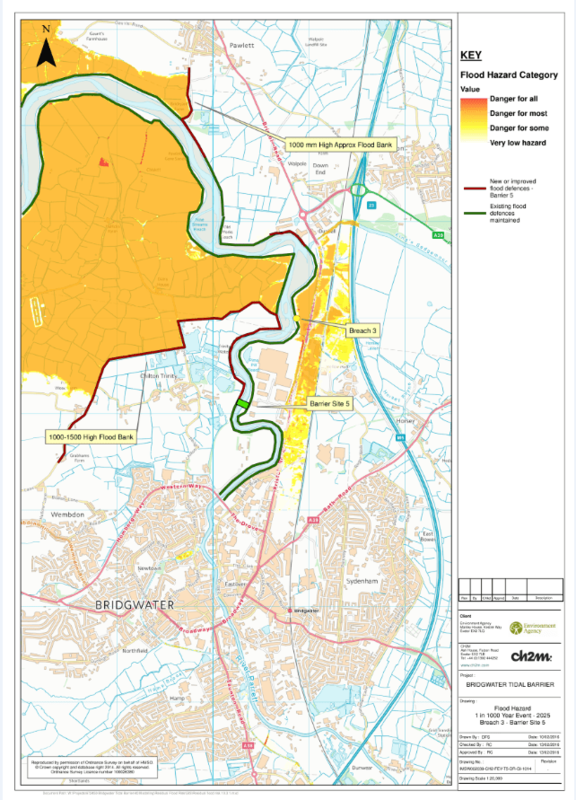 The maps below represent some of the 50 maps prepared by the BTB designers to support the decision on location of the BTB barrier; the complete set of maps can be found on the SDC Strategic Flood Risk Assessment page. The maps below show the impact of the river banks not being raised to match rising sea levels apart from the protected communities. 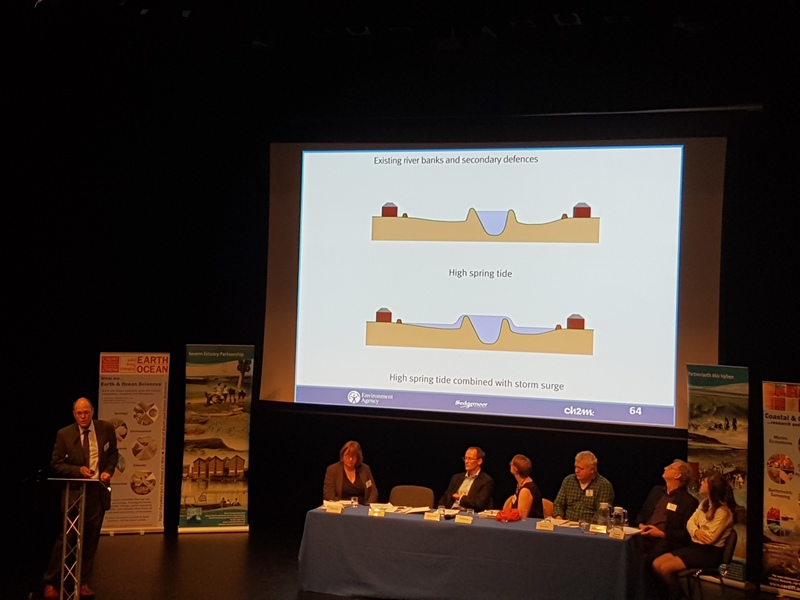 The end result is the preferential flooding of farmland with saltwater during certain tide and storm conditions as presented during the Severn Estuary Forum 2017 held in Bridgwater. None of this information was presented during the two EA/SDC public consultations in 2016. The map below shows one of breach locations modelled. A breach can occur anywhere, the map does not say its saline (salt) flood waters escaping from the river. They are merely designed to provide an idea of the likely consequence of it happening. The full pack of maps shows a number of breach locations and these are yet to published by Sedgemoor District Council. One of the maps produced by the designer showing the safety risks associated with their present scheme. Next PostNext Bridgwater Tidal Barrier is not in such a stupid place.